A lot of students should not be confused about the difference between Osmosis and Diffusion. However, it is a part of the learning process and leaves a lot of questions in the minds of students regarding the concepts. In this article, we will use simple definitions and examples to help you understand the major differences between these two terms. We have always preferred the simplest approach of using definition and examples to help you with your confusions. We will do the same in this article as well. So before going any further, we shall begin with the concepts. The diffusion of water across a selectively permeable membrane from an area of higher concentration to an area of lower concentration is osmosis. Osmosis is just a special type of diffusion, not a different method. Also, only when the movement of solvent particles happen across the semipermeable membrane, osmosis is said to be happening. The solution must be diluted for the movement of the solvent particular for osmosis to happen. There are a lot of examples which we can give to explain this concept of osmosis. The term tonicity (Gr. tonus, tension) refers to the relative concentration of solutes in the water inside and outside the cell. For example, in an isotonic solution, the solute concentration is the same inside and outside a red blood cell. The concentration of water molecules is also the same inside and outside the cell. Thus, water molecules move across the plasma membrane at the same rate in both directions, and there is no net movement of water in either direction. The hypotonic condition is called creation in red blood cells. In a hypotonic (Gr. hypo, under) solution, the solute concentration is lower outside the red blood cell than inside. Conversely, the concentration of water molecules is higher outside the cell than inside. As a result, water moves into the cell, which swells and may burst. We have heard a lot about this concept of diffusion. According to its definition, it is a process in which the molecules move from the area of a higher concentration to lower concentration. It happens when the concentration must be equalized throughout the medium. Again, for diffusion, there are many examples which we can give. One of the most common examples is of perfume. When you spray perfume in a room, the fragrance spreads within a few seconds and everyone can smell it in the room. Another easy example of this process is when you add a drop of food coloring in water and the color of water changes. In this quick transport of the molecules, diffusion is the process which plays the most important role. 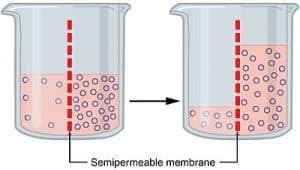 In Osmosis, the particles of solvent molecules travel across the semipermeable membrane while in diffusion, the molecules from a higher to lower concentration. The example of diffusion is the spreading of perfume in the air when it is sprayed while in osmosis, the best example is the spread of water in the roots of plants. We really hope that these concepts are quite clear for you. Keep visiting our website and get rid of more of such confusions.